The Finnish AV Production company Grassmark Oy, founded in 2007, specialises in broadcast & event video productions and streaming. They offer turnkey-solutions to many sports events, concerts and corporate events and also collaborate with other companies, such as ChyronHego and the Finnish National Broadcasting Company YLE. Their biggest events for 2018 are in the field of sports, such as the National Premier League of Football and the Paavo Nurmi track and field games. In early 2018, Grassmark bought a number of Sonifex products: twelve CM-CU21 commentator units, three DHY-04GS automatic GSM hybrids and a number of audio distribution amplifiers. Esa Arokki, Vice President of Grassmark Oy commented: “We ended up using Sonifex CM-CU21's by trying to make our own devices first. Pretty soon we noticed that it would have taken too many resources to do this by ourselves. So, we tested a couple of different alternatives and ended up purchasing the Sonifex units. They were familiar to us from broadcast use and they have fulfilled our expectations when it comes to audio quality. The build quality is also excellent, they’re really sturdy and ideal for sports ground use. It gives you a great feeling of reliability and trust. At the moment we do more than 1000 productions per year and we’re proud to be able to hire more people each year”. Grassmark plans to buy more Sonifex products in the near future. They have recently won a tender by YLE to do outsourced radio productions from religious events. It provides two fully featured commentator positions and a third guest position that can alternatively be used as a line-level input. 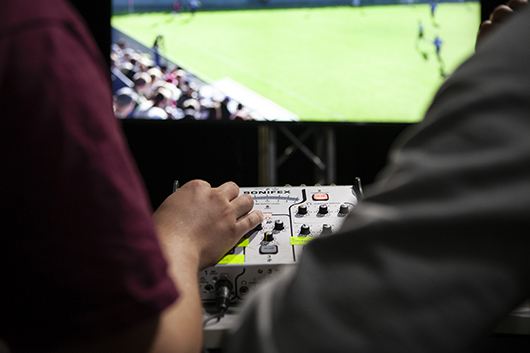 Each position has an individual output, with two additional outputs providing a mix of all active commentary channels. There are two talkback output channels, with a built in limiter and extensive headphone monitoring facilities for any input to any ear of the attached headset/headphones.